A home run is a home run is a home run? Indeed. Except if it has been “determinologized.” If terminologization is when a common everyday word turns into a technical term, then the reverse process is when a technical term from a technical subject field becomes part of our everyday vernacular. The process was identified, analyzed and, I believe, named by Ingrid Meyer and Kristen Mackintosh in a paper in Terminology in 2000. They describe two categories of determinologization. 1. The term retains essentially the same meaning, but is no longer used by subject matter experts referring to a concept in their field. Rather the subject matter might have become popularized, and laypersons understand enough about the concept to use the term. The term in the layman’s use refers to a “more shallow” meaning of the concept or one that also has other connotations. Good examples are medical terms of diseases that are prevalent enough for all of us to have an idea about them. Insomnia, for instance, is a condition that for medical professionals is highly complex. They might break it down into sleep maintenance insomnia, sleep-onset insomnia, etc. and treated it with benzodiazepines. It might be chronic or intermittent, familial or even fatal. At some point, we all might have talked about it in a less medical sense. Here is the entry in the Urban Dictionary—a listing on this website is a good indication that a term has become a word in common usage. And to the right is an excerpt from the South African Mail&Guardian about a chess player who can’t sleep before competitions. In these examples, the meaning behind the word “insomnia” remains the same as in the medical context: Someone can’t sleep. But our associations don’t take us to the clinical setting, rather we get a sense of the mood of the sufferer or the chosen cure. 2. The word now describes a completely different concept. While it shares some characteristics with the meaning in the technical subject of the term, it does no longer share the essential characteristics. Enough baseball terminology has made it into the American vernacular that Dr. Jerry Roth at Sprachen- und Dolmetscher Institut in Munich gave it a special focus during our studies. He even had us meet in Englischer Garten for a game. Why do we care? Well, if we create new terms, borrow them from other fields or languages, terminologize or determinologize them, the receiver of our message—and that does include translators in many cases—only understands it if our usage has the appropriate level of precision. Understanding the methods that we have to our avail allows us to choose the best methods. The likelihood that others will understand our message then is much higher. And after all, understanding is what communication is about. When I was looking at football terminology the other day, I noticed many terms which used to be words in common everyday language and have become technical terms in sports terminology. That is what terminologization is all about. ISO 704 formally defines terminologization as “the process by which a general-language word or expression is transformed into a term designating a concept in a language for special purposes”. 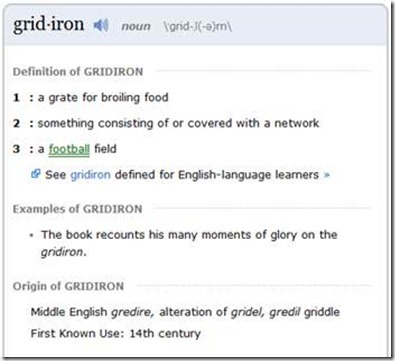 The following entry from the Merriam Webster shows quite well that the original meaning of “gridiron”, first recorded in the 14th century, was that of the cooking grate. You can find more about the etymology of gridiron in this entry of the Online Etymology Dictionary. 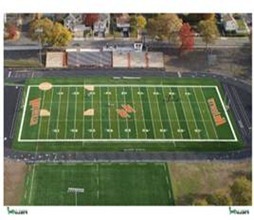 Today, the meaning of the football field is probably more common, especially in the United States. 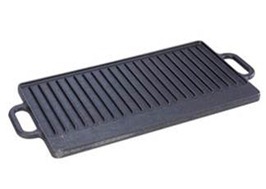 Gridiron has moved from the everyday language of cooking into the language for special purposes of American football. Today, it has a very specific meaning in football terminology, as this entry from the About – Football Glossary shows. Note that the definition used in this glossary is, by terminology management standards, not a proper definition. But the sample sentence shows how “fumble” is used as a noun in football today. The reverse effect of terminologization is called de-terminologization. There are some good examples in sports, too. Stay tuned for those.